Pizza is a very popular meal yet it is high in calories and often times very nutrient deficient. However, it has the potential to be converted into a disease fighting and savory dish with a few alterations. This metamorphism can be done by substituting regular flour for ground cauliflower. This pie will not have the same taste and texture as a traditional crust but offers a unique and satisfying meal in its own right. Cauliflower is a type of cruciferous vegetables which is one of the most nutrient dense of all the plant families. These types of vegetables have been linked with tumor suppression and the activation of many other disease fighting pathways. Including more cruciferous vegetable in the diet gives the body access to diverse and potent phytochemicals that work to fight disease. Other plant based toppings can only enhance the nutrient composition of this meal while providing varying flavors and textures. In order to attain a satisfying texture and cohesiveness in the crust a relatively high amount of cheese is required, making this dish somewhat high in calories. I suggest lightly topping the pizza with cheese and instead be very generous with the sauce and other plant based toppings for maximum flavor and nutrient content. If the majority of the food you eat is plant based and you stay within your calorie range, having unprocessed cheese in the diet on occasion is perfectly acceptable and not to mention satiating. As long as plant based topping are used the entire 8-10 inch pizza is under 600 calories and loaded with fiber, vitamins, minerals and phytochemicals. If you have weight loss goals and would like to cut calories eat half the pizza and serve a large salad on the side. 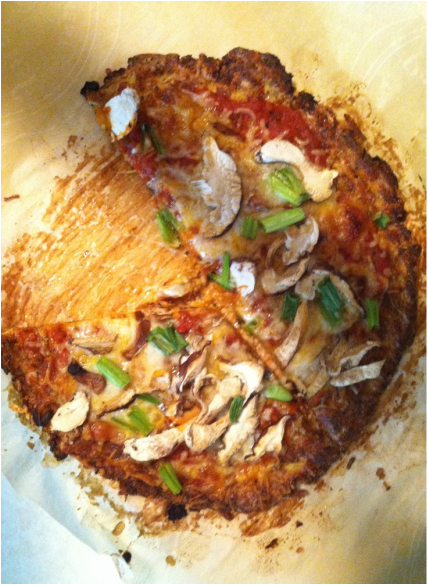 Directions: The most important step in achieving a doughy consistency in the cauliflower crust is to remove as much water from the vegetable as possible. Place the baking sheet in the oven and preheat at 425 degrees. Begin by removing the florets from the stem of the cauliflower and dicing them into a rice like constancy using either a food processor or grader. Once pulverized place the rice into a towel or cheese cloth and over a sink squeeze as much water out as possible. Its best to do it in small batches. Place the rice into a microwave safe bowl and heat for 3-5 minutes. Remove from the microwave and place on paper towel that is folded 2 sheets thick. With a spatula evenly spread the rice over the paper towel. Place more paper towel folded 2 sheets thick on top of the rice and set a heavy sauté pan on top. Press down on the pan to allow the paper towel to soak up the excess water. Place something heavy like a full bottle of cooking oil or several canned vegetables in the sauté pan. Let the paper towel absorb any remaining water for about 10 minutes. This step also gives the rice a chance to cool. If you feel like the rice still contains excess water put it back in the towel and squeeze over the sink. Just make sure cauliflower rice has cooled to prevent burning your hand. Measure out one cup of the rice and pour into a mixing bowl. Next add the egg, seasoning, garlic and both cheeses. Mix together with your hands until all ingredients are evening blended. Take the dough and place on a square of parchment paper. It is important that it is parchment paper and not wax paper. Wax paper can not be put in the oven. Spread out the dough to make a thin 8-10 inch crust. Form the perimeter of the crust higher then the center to prevent burning. Place the parchment paper with the pizza crust in the oven ontop of the preheated baking sheet. Let cook for 15 minutes. When finished remove the baking sheet from the oven and place on top of the stove. Using 2 spatulas carefully flip the crust onto its opposite side and place back into the oven for another 10 minutes. Next remove the crust from the oven and garnish it with the pizza sauce, mozzarella cheese and other chosen toppings. Return to the oven a final time for 10 minutes. When finished remove from the oven and cut into pizza slices using a pizza cutter or a knife. One head of cauliflower will make 2 to 3 pizza pies. You can eat one full pizza or serve it with a salad and split the pizza between two.